BarleyLife is a highly concentrated whole food that provides the many nutrients our bodies need but simply are not getting. BarleyLife users experience tremendous results because the nutrients are naturally occuring, quickly absorbed and utilized at cell level. Something that cannot be achieved with isolated vitamin/mineral supplements. BarleyLife contains naturally occurring vitamins, minerals, enzymes, chlorophyll, protein(amino acids), antioxidants and everything else God put in the barley leaf yet still unknown to man. BarleyLife is a tremendous benefit to our bodies cells. So much so that you will feel the difference. BarleyLife is made from the fresh live juice of young organically grown barley leaves (note: Official organic certification will take 2-3 years to obtain). The leaves are harvested at their peak nutrient level and immediately juiced and cooled to prevent degradation of enzymes and other nutrients. The fresh barley juice is then spray dried at low temperature and mixed with reduced amounts of high quality maltodextrin. A small amount of brown rice and kelp is added to provide other nutrients not in the barley juice. The maltodextrin locks in and protects the barley juice from oxidation providing a vastly superior product that maintains its quality while on the shelf. 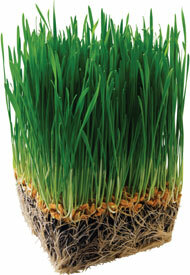 BarleyLife captures consistently higher levels of the nutrition found in barley grass. And its rich nutrients are more fresh, active, and alive. BarleyLife is a powder that can be mixed in pure water or juice or even taken dry in the mouth. We strongly believe that BarleyLife is the best green juice product on the market. Numerous long term barley juice users are noticing increased benefits in a short period of time. You owe it to yourself to give BarleyLife a try. Who said, "If it's good for you, it has to taste bad?" 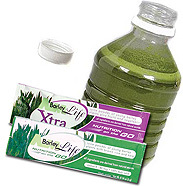 AIM BarleyLife Xtra is a delightful, cherry-apple flavored green barley juice powder. Naturally sweetened with fruit and vegetable powders and Lo Han (a fruit specifically chosen for its sweetening ability), AIM BarleyLife Xtra provides a healthy, nourishing alternative to the plethora of sugar-filled drinks available today. 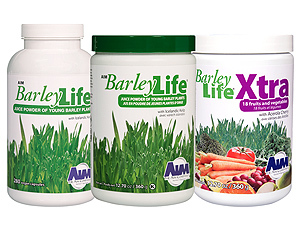 AIM Barleylife, a natural source of energy and nutrition for athletes of all ages. Hippocrates', the Father of Modern Medicine, favorite food for sick folks was barley gruel. Hopefully one day all health practitioners will have a favorite food for sick folks! We believe that BarleyLife is a tremendous food for healthier cells! One that health professionals should seriously consider.